In this interview, juror Michael Speaks was clear that his remarks were that of an individual juror and that he in no way was speaking for the entire jury. In other words, this could not be considered as an official jury report. COMPETITIONS: As for research possibilities, isn’t this new facility programmatically about reentry into civilian life by veterans? Michael Speaks: Many veterans are non-traditional students, and having a prominent location and facility on campus for them is important. Indeed, one of the Veterans organizations to be housed in the National Veterans Resource Center (NVRC) is the Institute for Veterans and Military Families (IVMF). But, as you note, returning to a university campus that is welcoming is important, and the NVRC will serve as the central point of that re-entry. 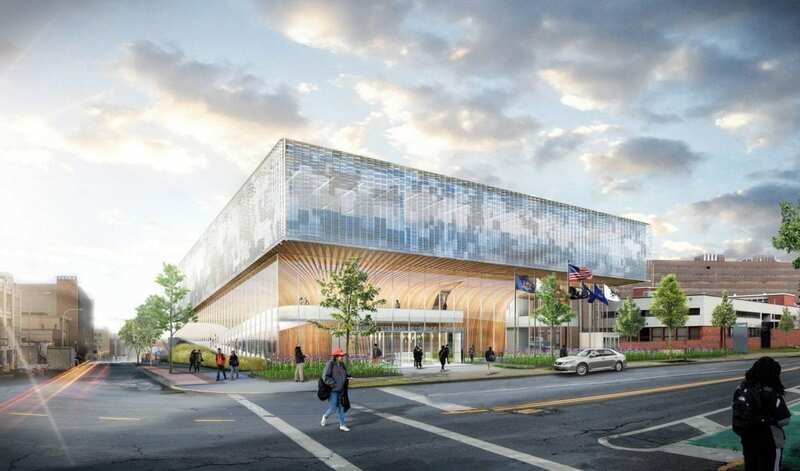 You may know that Syracuse really grew to become a large university after the Second World War, based largely on veterans returning from the war and taking advantage of veteran’s benefits. There is a long history at Syracuse of involvement with the veterans’ community. When our new Chancellor, Kent Syverud, was hired, he made veterans’ affairs and veterans’ issues a central part of his administration and agenda. As I recall, during his first address as Chancellor, he emphasized veterans’ issues as one of the most important issues to be addressed by his administration. COMPETITIONS: From your past experiences with competitions, you have seen both open and invited competitions (Taiwan Taoyuan Terminal 3 competition). I wondered what was behind this choice for an invited competition process. 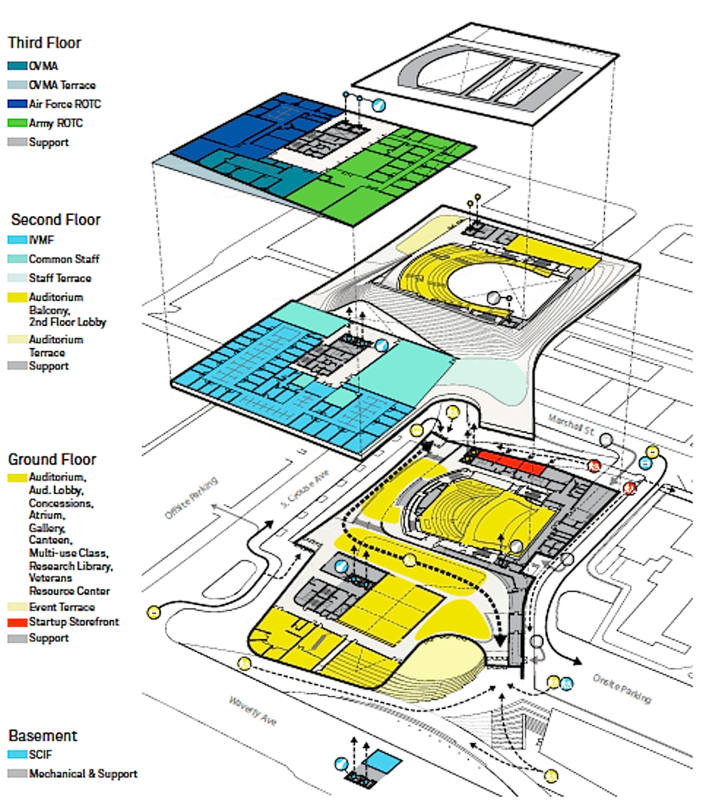 MS: Over the past 18 months we have been involved with developing a University Master Plan with Sasaki Associates. Early on the masterplan was designated as a framework rather than plan, emphasizing that it would be a living document that would adapt and change over time. That plan was signed off on last May. Although it was never completely finished—it was called a ‘draft framework plan.’ The NVRC was is to be among the very first built projects to emerge from that framework plan. 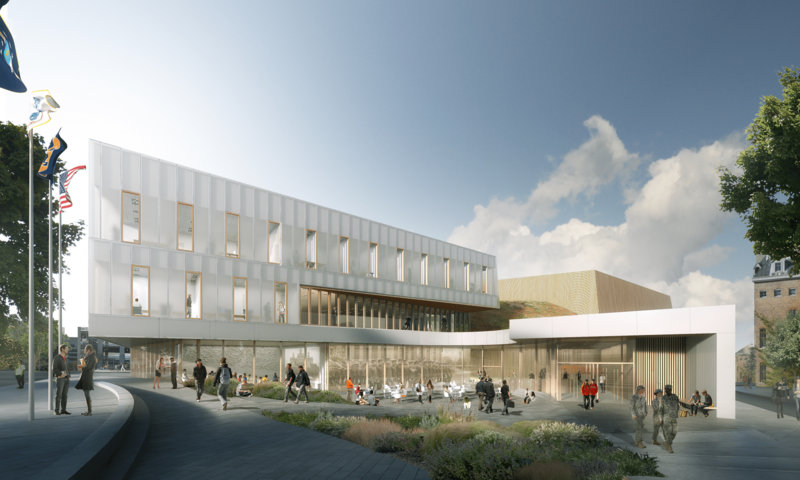 The decision was made to run the NVRC building selection as a competition, something the university had not done before. In the past, more typically there would have been a request for qualifications and sometimes a request for proposals, but never a competition as such. At least that is my understanding. The idea for the two-stage competition was that the NVRC would be the first building project that resulted from the framework plan. It would be an important project in itself; but it would also announce the true start of the building process. 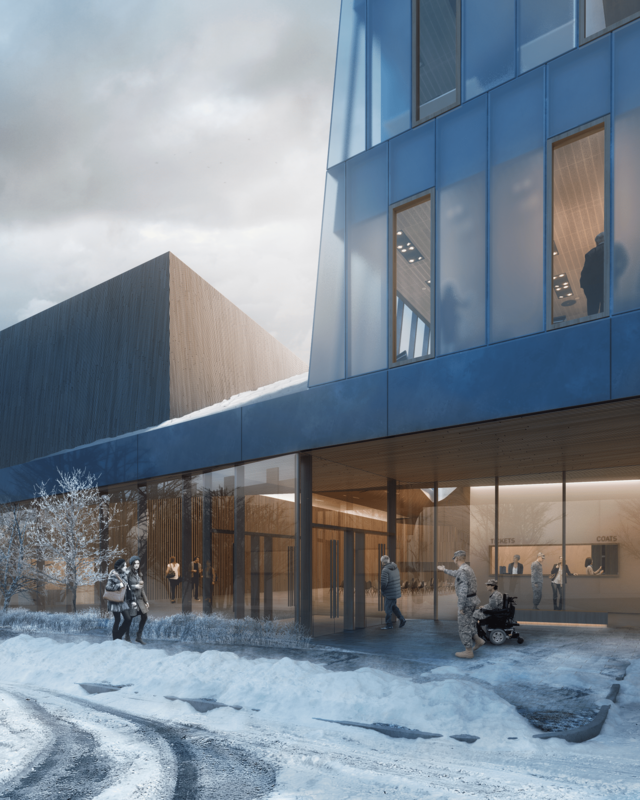 The NVRC is necessarily located on one of the most prominent sites on the campus, so there was great interest in attracting world class design talent for the design of the building. 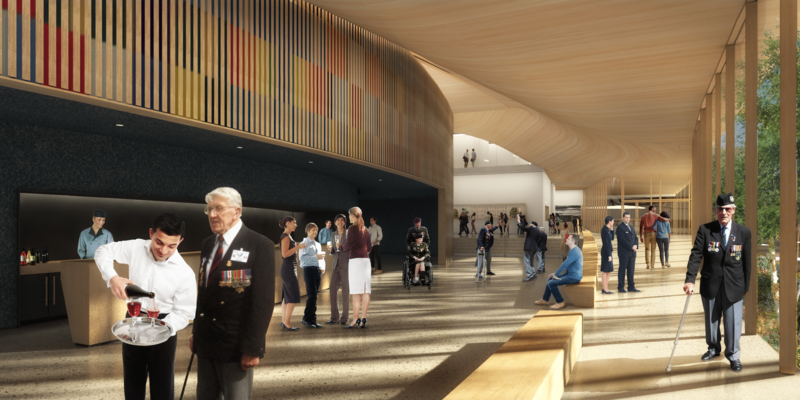 As such, it would be a fitting project to celebrate the university’s history with veterans and the veterans community and to announce the commencement of the framework building process. 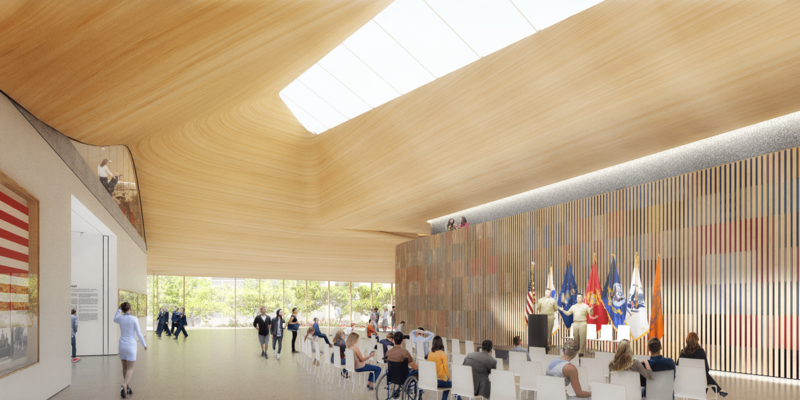 The university decided in consultation with the members of the campus framework advisory group and the Institute for Veterans and Military Families, to use the competition as the means of procuring a design firm to design the building. The decision was made to hire Martha Thorne, who is the Dean of the School of Architecture at the IE Madrid and Executive Director of the Pritzker Prize, as professional adviser. COMPETITIONS: So my question is, why an invited competition, rather than an open competition, as was the case where you were a juror in Taiwan? MS: We were looking for very high quality design; we also wanted to curate what that pool looked like—maybe this is what a lot of (invited) competitions were looking for—because we were looking for emerging firms that were U.S.-based. We were looking for firms that had experience with this kind of program, that had an interest in this typology, and in our region of the country. We were not looking for architects that were stars already, but instead emerging firms that would become the next great firms in over the next five or six years. MS: If you are looking for great value in design and expertise, you very likely get greater value if you curate a bandwidth of firms that you know have a certain kind of experience and have done a certain kind of projects—firms that have a certain capacity, but who are not the absolute best five or six firms in the world and demand the greatest attention and the highest fees. In every way it’s about value. COMPETITIONS: I would have said that these are the ‘usual suspects,’ and I’m sure a lot of architects would have felt the same way; but I guess it’s a matter of degree. MS: Let me clarify this a little. We started with a selection of 26-28 firms. Those firms were curated in a way I’m suggesting: they were of a certain bandwidth, a certain capacity. All had to be able to do the project, and all at least had to have offices in the United States. 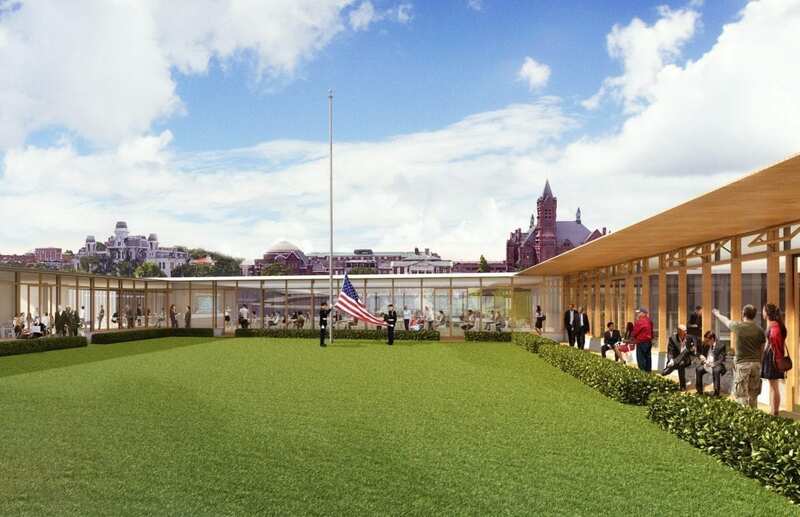 And, as it turns out, you are right: the three that were ultimately selected were among the finalists selected for the Obama Library Competition. But the list we started with had firms that laypersons would certainly not recognize and many professionals might not recognize. We had a first round of discussion convened by Martha Thorne, during which the jury discussed and selected these three finalists. They are reasonably well known, but are not Frank Gehry, Rem Koolhaas or Zaha Hadid. That is to say that they are not among the most recognized architects in the world, but in five years very well might be. COMPETITIONS: Were the people who were on the initial selection committee also on the final design jury? MS: One and the same. COMPETITIONS: That’s fortunate, because you sometimes have separate committees in that two-stage selection process. I noticed that several laypersons were on the jury. Sometimes that slows down the process, since many of those are not used to reading architectural drawings. Was there a lot to the learning curve, and how well did it go? MS: There were jury members who were not professional architects. It was important that the jury had members from the campus community, and from constituencies that would be served by the building. But that was not a problem. Martha Thorne made sure that all members were well informed and were apprised of all dimensions of competitions like this. In addition, there were some jurors who had some experience with building and construction. We had several professionals and were also joined by Suzanne Stephens from Architectural Record. The final three presentations were so very clear, very strong, and all had great models. Laypersons sometimes have trouble reading plans, but they all have an easier time with models. The presentations were all excellent; so that really wasn’t an issue. 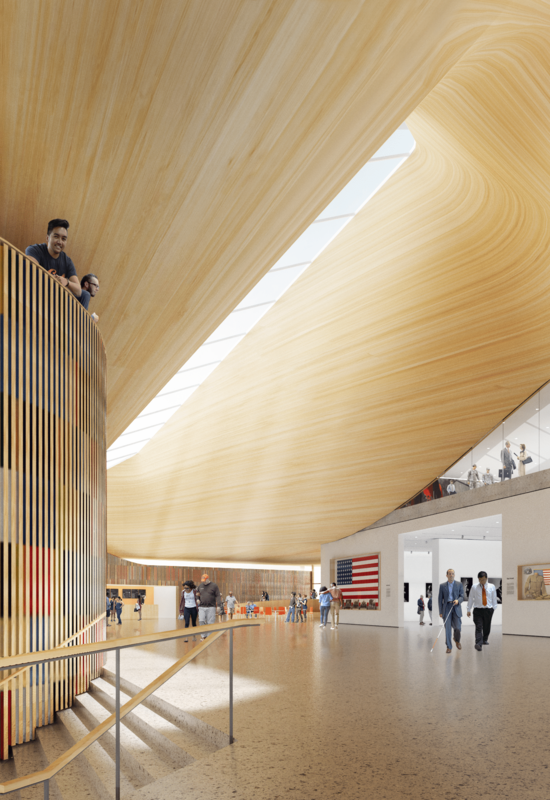 COMPETITIONS: Sometimes we think of a building typology—courthouses, schools, museums, etc. Many times they are easily recognizable. 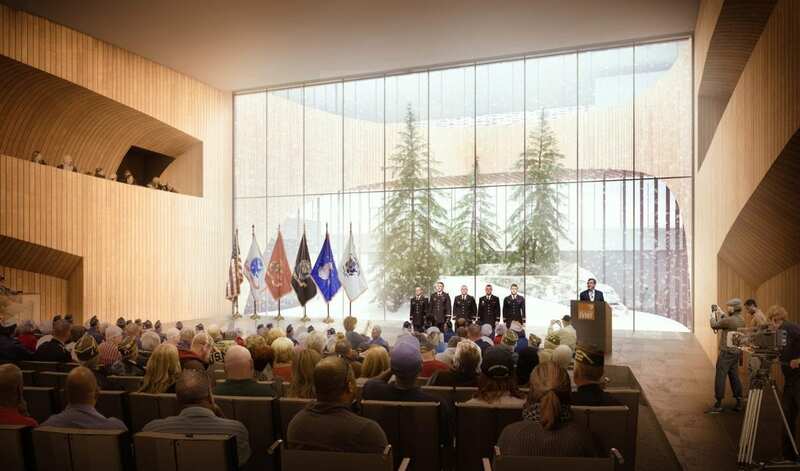 MS: The program for the building is intended to house a number veterans-related organizations on campus—IVMF, Officers Training Corps, etc., and a number of student veteran, Officers Training Corps etc., and also classroom and vocational space for veterans on campus. 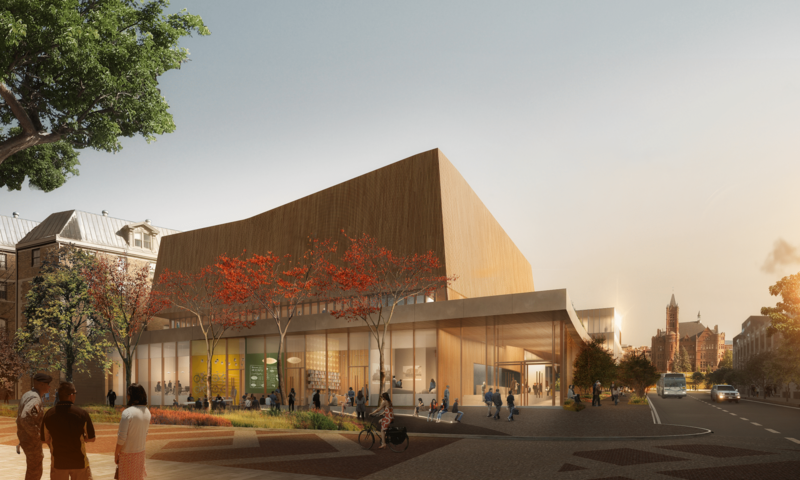 But it is also intended to serve the larger university campus. 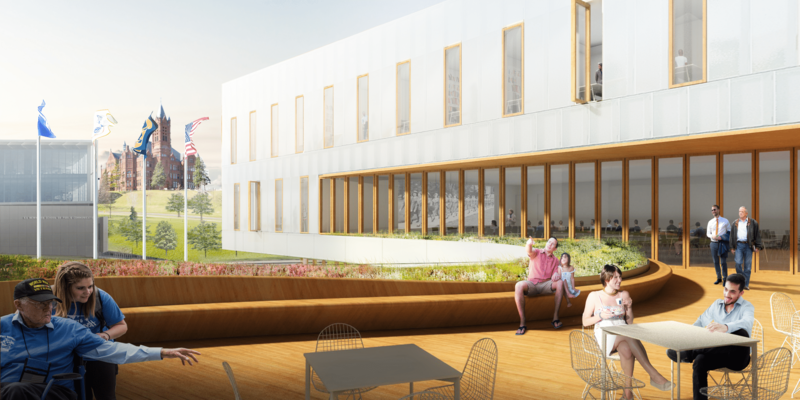 It will have a large auditorium that can accommodate lectures from across the campus community. Besides serving the veterans community, the building is an unusual typology: It serves a number of university purposes besides the ones I mentioned, but it is also situated on the campus at a very important juncture and crossroad—many students, faculty, parents and visitors will walk by it and through it. The NVRC fronts Waverly Avenue, one of the principle traffic axes on the edge of campus. The back side of the building fronts Marshall Street, which collects a host of small retail shops and other small buildings. It was interesting to see how the three firms treated the backside of the building—the Marshall Street side. Each of the three firms treated the building as an expression of this typology, and they did so in very different ways. Each also handled the site quite differently. David Adjaye’s approach to the building was to make a very strong, authoritative, formal expression that gestured toward the university administration building. The building was somewhat less porous to the the Marshall Street side. It was really a solid, fixed, exquisite, iconic expression of the NVRC. If Adjaye’s proposal was on the strong-formal-iconic-singular-object end of that the spectrum, the Snøhetta project was on the other end of that spectrum. It was a project that treated the site, which was not very large, almost as an urban block. The building was not singular, but broken into four or five different components, and there was circulation from the backside and front and even through the sides of the building. It was a very porous and almost urban-scale project—although it was a building project. So the Snøhetta project was much less muscular and much less iconic in its approach to the typology, in its expression of the typology, and thus the NVRC’s identity. Snøhetta treated the backside of the building as retail. Adjaye’s backside was almost mute—it was almost a singular solid wall. In many ways, the SHoP project split the difference between the two. It also had a strong, formal facade, and made a strong formal statement, almost-but-not-quite iconic. On the Waverly side it’s a very rigorous, yet open building, because of the glass. On the backside, unlike Adaye’s proposal, which created a solid wall on the Marshall side, the SHoP proposal has an art gallery that opens onto Marshall Street. The SHoP proposal was mostly glass and thus open and welcoming; but it was also very strong and present. And on the Marshall Street side it was more porous and open to the public. 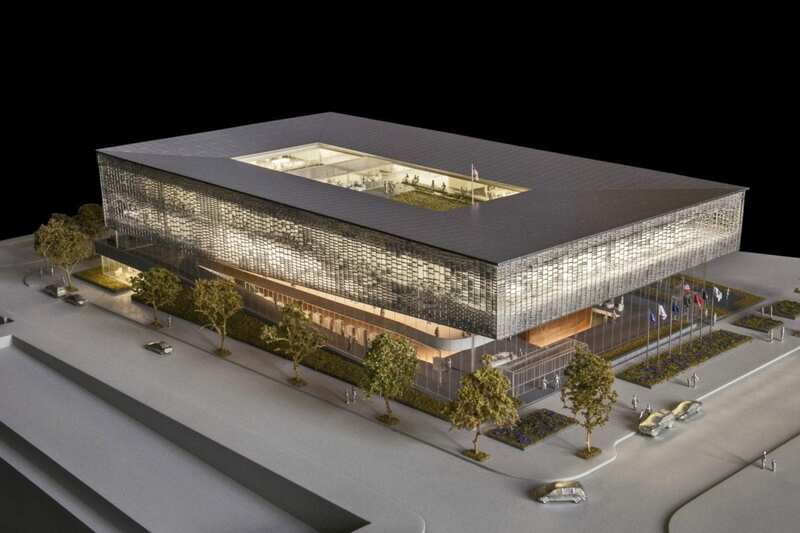 COMPETITIONS: What you are telling me about Snøhetta was the way they treated the Calgary Library competition. In other words you could see through the building. That urbanistic strategy was what won the competition for them. MS: If you were to scale out in plan view, the Snøhetta proposal might appear as the design for an entire city block. Each of the components of the building could be construed as singular buildings. While the jury saw the Adjaye building as a strong expression, we saw Snøhetta’s, especially in terms of its formal expression, as more urbanistic. Note: Images from the David Adjaye entry were not available at this writing. Michael Speaks, PhD, is dean of the School of Architecture at Syracuse University. Previously, he was dean of the College of Design at the University of Kentucky from 2008-2013, director of the graduate program and founding director of the Metropolitan Research and Design post-graduate program at the Southern California Institute of Architecture in Los Angeles from 1998-2005. He has served on the Taiwan Pop Music Center Competition jury (2008) and, more recently, on the Taoyuan Terminal 3 Airport Competition jury in Taiwan (2015).